Cannondale has signed promising young Latvian rider Toms Skujins, who won a stage of the Tour of California in 2015. Cannondale has signed promising young Latvian rider Toms Skujins, the team announced Tuesday. He attended the team’s recent camp in Aspen, Colorado. 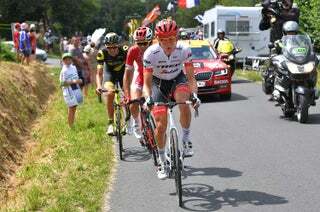 Skujins, who spent the 2014 and 2015 seasons with Hincapie Racing, had a breakthrough season this year, registering several wins at UCI races, including the Winston-Salem Classic in May and three stages of the Tour de Beauce, where he finished second overall. 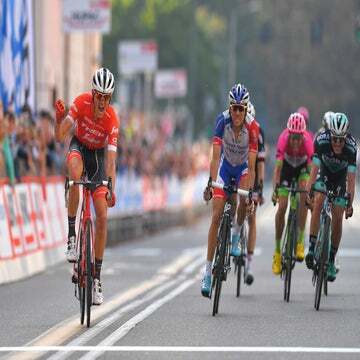 His biggest result came at the Amgen Tour of California, where he won stage 3 with an impressive solo effort into San Jose to take the race lead, which he held for three stages. He also finished eighth overall at the USA Pro Challenge, and led the UCI’s America’s Tour after finishing second at the Reading 120 in September. With that result in Reading, the 24-year-old Skujins secured the individual NRC ranking and the top team ranking for the Continental Hincapie Sports team. Even with those results, Skujins was without a WorldTour contract in mid-September, telling VeloNews he would accept a Pro Continental contract if it came along. Skujins, Cannondale’s final roster signing for 2016, has now made the jump from Continental to WorldTour, bypassing Pro Continental status altogether. Hincapie Sports manager Tom Craven was effusive in his praise for Skujins earlier this year, describing the young Latvian as a true hardman of the sport.